ISLAMABAD, Pakistan — The Pakistani police have arrested 13 suspects in two raids that they said foiled several terrorist attacks, security officials said Monday. Six men were arrested Monday who belonged to a banned militant group, Sipah-e-Sahaba, and had links with the Taliban militant group linked to Baitullah Mehsud, said Tahir Gujjar, the deputy superintendent of police in Sargodha, a city in northern Punjab Province. Mr. Mehsud is the Taliban leader who is believed to have been killed this month. The militants who were arrested, Mr. Gujjar said, were planning to attack several places of worship in the Pakistani heartland of Punjab: Shiite mosques, churches and a place of worship of the Ahmadiyya sect, which the government considers not Muslim. The authorities also said the men wanted to blow up broadcast towers of Telenor, a Norwegian telecommunications company. Seven other suspects were arrested in the southern port city of Karachi on Sunday. The police, acting on a tip from intelligence sources about an imminent terrorist attack, arrested seven men from the outlawed group Lashkar-e-Jhangvi, security officials said Monday. In the Monday arrests, the police, acting on intelligence information, captured three men in a predawn raid at a bus terminal, and under interrogation, they disclosed the location of others, Mr. Gujjar said. One of the arrested, Hafiz Abu Bakar, was the main leader of Sipah-e-Sahaba (Army of the Companions of the Prophet) in a town near Sargodha, he said. Sargodha is the base of two squadrons of Pakistan Air Force F-16s. Private television news networks broadcast the images of the men arrested Monday. The authorities presented the heavily bearded men to the media, blindfolded and with hands tied behind their backs. A cache of weapons the authorities said had been recovered from them was displayed on a table. Saud Mirza, a senior Karachi police official, said the raid in Karachi recovered 3 suicide jackets; 4 Kalashnikov automatic rifles; 2 gas masks; 33 pounds of explosives; and about 5 pounds of heroin. Mr. Mirza said the suspects were involved in drug trafficking to finance their activities. 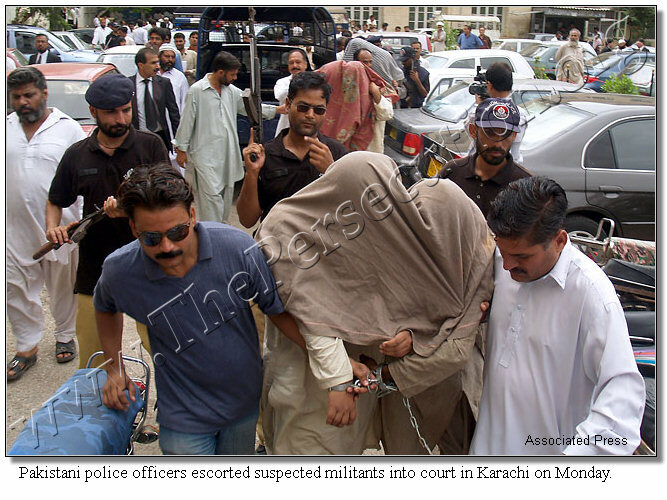 One of the men arrested, Muhammad Shahzad, who is known as Phelavan, or the Wrestler, is believed by Pakistani intelligence to have been a close associate of Amjad Hussain Farooqi, a well-known militant leader involved in an assassination attempt against the former president of Pakistan, Pervez Musharraf. Mr. Farooqi, who was killed in a shootout in southern Pakistan in 2004, was implicated in the beheading of Daniel Pearl, a reporter for The Wall Street Journal, two years earlier. In an attack on Monday, gunmen killed an Afghan television journalist and severely wounded another in northwestern Pakistan, The Associated Press reported. Janullah Hashim Zada, who worked for the Afghanistan-based Shamshad TV, was gunned down as he traveled on a public minibus from Torkham in the Khyber tribal region to the northwestern frontier city of Peshawar, The A.P. reported, citing a Khyber Agency official, Omair Khan. Mark McDonald contributed reporting from Hong Kong.